There are no words to be spoken on a persistently rainy day when only thing you can do is either watch re-runs of something – anything – curled up on the couch with your dog. Or you can take a break from that, and not only make these cookies, but also try a pistachio-olive oil cake recipe and fail miserably. Or bake oatmeal-raisin cookies only to find out you don’t have raisins but lots of chocolate chips to substitute, and then realize that the recipe yields seven – 7 – dozen after you mix all the ingredients. Then you can finish your day with trying to roast a chicken on a cast iron skillet just to give that skillet a workout. 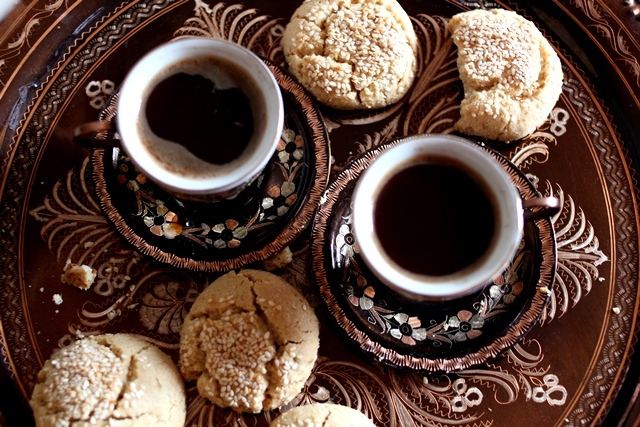 Then you make coffee, grab the tahini cookies and head to the couch. 2. With a wooden spoon or spatula, break the egg yolk in a big mixing bowl, add tahini and stir until combined. 2. Add softened butter to the bowl, stir until all mixed together. Add sugar and continue stirring. 3. Add walnuts, give it a stir again. Add 2.5 cups of flour. If the dough is not coming together, gradually add more flour until the dough stays together when you can make a walnut size piece balls. 4. Dip the top of each ball in egg white, then sesame seeds. 5. Place cookies in a cookie sheet, lined with Silpat or parchment paper. Or grease the cookie sheet. 6. Bake in preheated oven for about 30 min or until the bottoms are golden brown. It will be soft when you touch it but it will harden once it cools. With all the nuts, seeds and butter, these cookies must be heavenly. 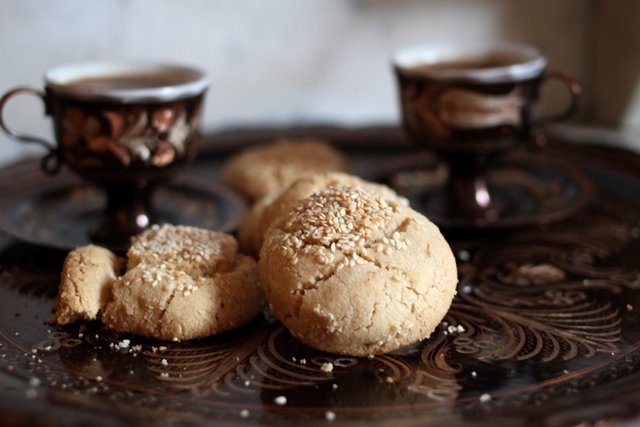 I’ve never used tahini for making cookies before but they do look delicious! I’ll be they are perfect with coffee or tea. Sounds like a great way to spend a rainy day! These cookies look terrific – super flavor. Love the overhead shot – really pretty (all the pictures are, but that one particularly caught my attention). Good stuff – thanks. Thank you guys, definitely a keeper for a tahini lover, but it might be a tad bit strong for ones who are not used to it. These look so very good Ilke. I love tahini, but I don’t bake with it very much. Thank you for sharing. I hope to try these too. 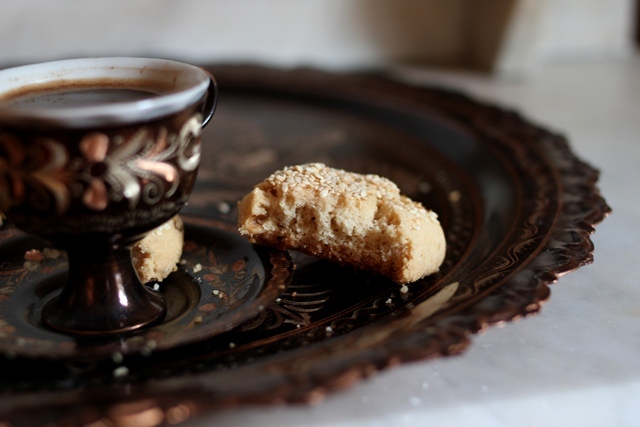 We’ve had some bad weather lately and cookies sound like the perfect cure. I want one right now!! 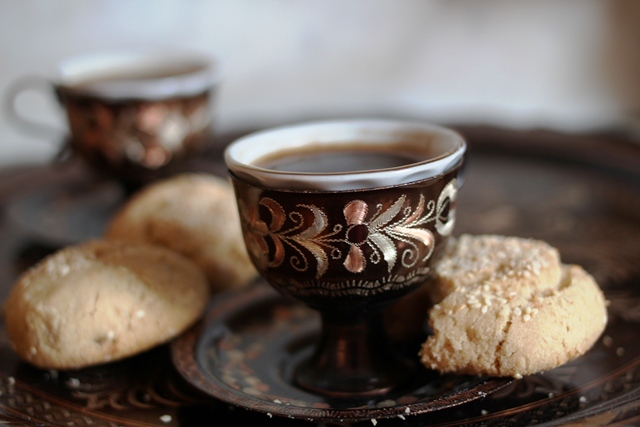 Actually, I want two and time for a cup of turkish coffee with you! We should plan on that!